Unit testing is one of the cornerstones of modern software development, but there’s a surprising lack of advice about how to write good unit tests. That’s a shame, because bad unit tests are worse than no unit tests at all. Over the past decade at Electric Cloud, I’ve written thousands of tests — a full build across all platforms runs over 100,000 tests. In this post I’ll share some tips for writing robust, maintainable tests. I learned these the hard way, but hopefully you can learn from my mistakes. A key focus here is on eliminating so-called “flaky tests”: those that work almost all the time, but fail once-in-a-great-while for reasons unrelated to the code under test. 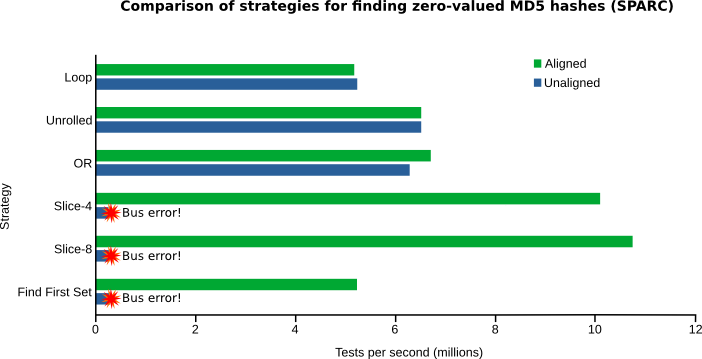 Such unreliable tests erode confidence in the test suite and even in the value of unit testing itself. In the worst case, a history of failures due to flaky tests can cause people to ignore sporadic-but-genuine test failures, allowing rarely seen but legitimate bugs into the wild. 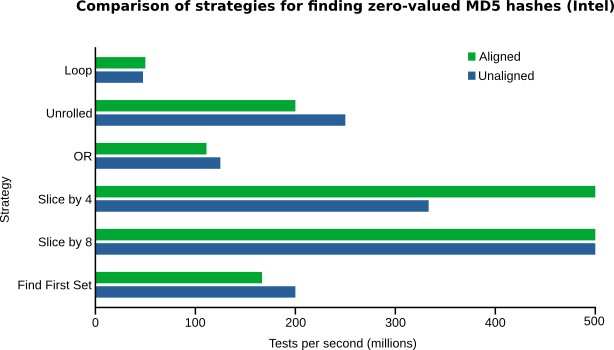 If that’s not enough to convince you to eliminate flaky tests, consider this: suppose each of your flaky tests fails just one time out of every 10,000 runs, and that you have a thousand such tests overall. At that rate, about 10% of your CI builds will fail due to flaky tests. Now that I’ve got your attention, let’s see how to write better tests. Got some tips of your own? Add them in the comments! Cleanup the previous server instance (if any). Instantiate the server on port 6003. Connect to the server via port 6003. Send some message to the server via the socket. Assert that the response received is correct. At first glance this seems pretty safe: no standard service uses port number 6003, so there won’t be any contention with third parties for that port, and by front-loading the cleanup of the server we ensure that there won’t be any contention with our other tests for the port. And, of course, it (seems to) work! In fact, it probably works almost every time you run it. But rest assured: one day, seemingly at random, this test will fail. For us the failures started after literally years and tens of thousands of executions. We never saw the same test fail twice, but the failure mode was always the same: “Only one usage of each socket address (protocol/network address/port) is normally permitted.” I wish I could say with certainty why the failures started happening — I suspect that our anti-virus software transiently grabs a dynamic port, and sometimes it just happens to grab the port that we planned to use. Fortunately the solution is simple: instead of using a hardcoded port number, use a dynamic port assigned by the operating system. Usually that means binding to port number zero. This is slightly less convenient than a hardcoded port number, because you’ll have to query the socket after its bound to determine the actual port number, but that’s a small price to pay to be confident you’ll never have a spurious test failure due to this mistake. 2. Never use “sleep()” to synchronize test threads. Sleep a bit to give the thread time to get started. Open a connection to the server port. There are some problems with this strategy. If you set the delay too short, occasionally the test will fail because the server socket won’t be ready — when you try to open the client-side connection you’ll get a connection refused error. Conversely, you can make the test fairly reliable by setting the delay very long — multiple seconds — but then the test will take at least that long to run, every time you run it. 3. Never rely on timing data to verify behavior. The problem is that your test runner might get put to sleep between step 2 and 3, and again between step 3 and step 4 — there’s just no way to control what else might be happening on the computer executing the tests. That means that the delta between the times could be significantly higher than the 200ms you expect. Depending on your hardware and timers, it could even be less than 200ms, despite your code being implemented correctly! There are at least two robust alternatives to implement this test. The first is to add a counter to the code under test, to be incremented whenever the read operation times out. In the test you could check the value before and after the attempted read, and reasonably expect the value to increased by exactly one. The second approach is to forgo the explicit validation altogether — if the test completes, then the timeout must be operating correctly. If the test hangs, then the timeout must not be operating. 4. Never rely on implicit file timestamps. Verify that the unit under test behaves correctly given that X is newer than y.
Superficially this looks sound: X is created after Y, so it should have a timestamp later than Y. Unless, of course, it doesn’t, which can happen for a variety of odd reasons. For example, the system clock might get adjusted underneath your feet, due to NTP or another time-synchronization system. I’ve even seen cases where the file creations happen so quickly that the two files effectively have identical timestamps! The fix is simple: explicitly set the timestamps on the files to ensure that the relationship is as expected. Generally you should specify a difference of at least 2 full seconds, to accommodate filesystems that have very low resolution timestamps. You should also avoid relying on subsecond timestamp resolution, again to accommodate filesystems that don’t support very high-resolution timestamps. 5. Include diagnostic information in test assertions. Now if the assertion fails the test harness will show you value of errors, so you’ll have some useful information to start your debugging. 6. Include an explanation of the test in the comments. Everybody knows it’s important to write unit tests. Following the suggestions here will help make sure that your tests are reliable and maintainable. If you have tips of your own, add them in the comments! Somebody asked me the other day what portion of the Electric File System (EFS) is shared code versus platform-specific code. The EFS, if you don’t know, is a custom filesystem driver and part of ElectricAccelerator. It enables us to virtualize the filesystem, so that each build job sees the correct view of the filesystem according to its logical position in the build, even if jobs are run out of order. It also provides the file usage information that powers our conflict detection algorithm. As a filesystem driver, the EFS is obviously tightly coupled to the platforms it’s used on, and the effort of porting it is one reason we don’t support more platforms than we do now — not that a dozen variants of Windows, 16 flavors of Linux and several versions of Solaris is anything to be ashamed of! Note that here I’m measuring only actual code lines, exclusive of comments and whitespace, as of the upcoming 6.1 release. In total, the Windows version of the EFS has about 2x the lines of code that either the Solaris or Linux ports have. The platform-specific portion of the code is more than 6x greater! Here you can see that the Windows port has always been larger than the others, but it’s really just a handful of Windows-specific features that blew up the footprint so much. The first of those was support for the Windows FastIO filesystem interface, an alternative “fast path” through the kernel that in theory enables higher throughput to and from the filesystem. 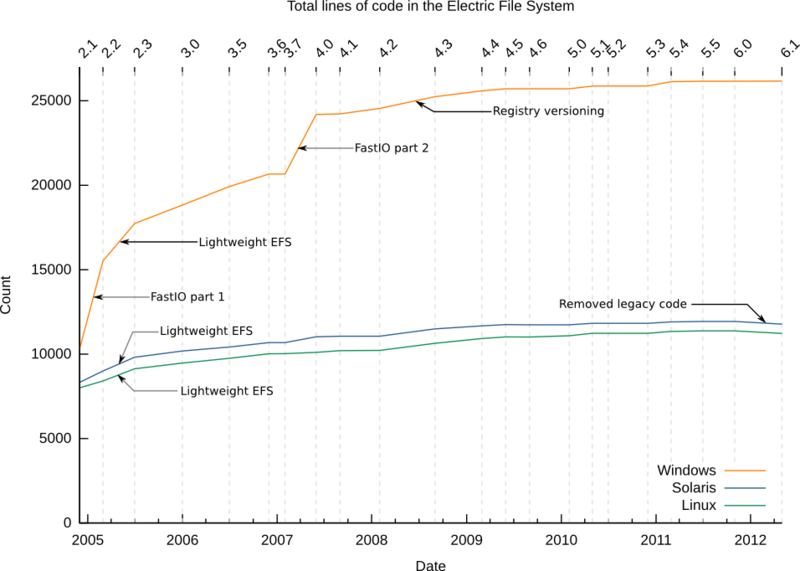 It took us two tries to get that feature implemented, as shown on the graph, and all-told that contributed about 7,000 lines of code. The addition of FastIO to the filesystem means that the Windows driver has essentially three I/O interfaces: standard I/O, memory-mapped I/O and FastIO. In comparison, on Linux and Solaris you have only two: standard I/O and memory-mapped I/O. The second significant difference between the platforms is that on Windows the EFS has to virtualize the registry in addition to the filesystem. In the 4.3 release we significantly enhanced that portion of the driver to allow full versioning of the registry along the same lines that the filesystem has always done. That feature added about 1,000 lines of code. I marked a couple other points of interest on this graph as well. First, the addition of the “lightweight EFS” feature, which is when we switched from using RAM to store the contents of all files in the EFS to using temporary storage on the local filesystem for large files. That enabled Accelerator to handle significantly larger files, but added a fair amount of code. Finally, in the most recent release you can actually see a small decrease in the total lines of code on Solaris and Linux, which reflects the long-overdue removal of code that was needed to support legacy versions of those platforms (such as the 2.4.x Linux kernel). I was surprised as well by the low rate of growth in the Solaris and Linux ports. Originally the Linux port supported only one version of the Linux kernel, but today it supports about sixteen. I guess this result reveals that the difficulty in porting to each new Linux version is not so much the amount of code to be added, but in figuring out exactly which few lines to add! In fact, after the 4.4 release in early 2009, the growth has been relatively slow on all platforms, despite the addition of major new features to Accelerator as a whole over the last several releases. The reason is simply that most feature development involves changes to other components (primarily emake), rather than to the filesystem driver. Note that this is looking only at unit tests for the EFS! We have thousands more unit tests for the other components of Accelerator, as well as thousands of integration tests. 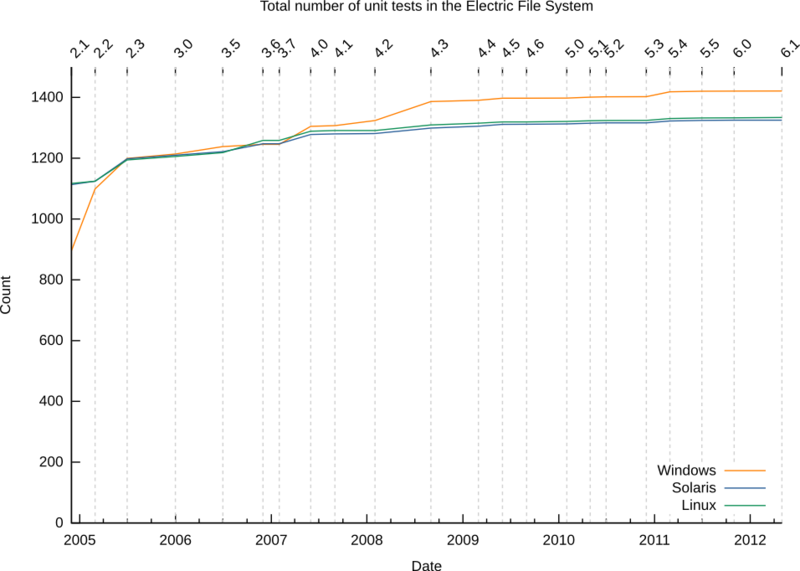 Thankfully for my credibility, the growth in number of tests roughly matches the growth in lines of code! But I’m surprised that the ratio of tests to code is not more consistent across the platforms — that suggests a possible area for improvement. Rather than being discouraged by that though, I’m pleased with this result. After all, what’s the point of measuring something if you don’t use that data to improve? This error means the length of some command-line in your makefile has grown past the system limit, which is typically in the 32 to 256 kilobyte range. It’s surprisingly easy to hit that limit. You start with a small list of object files to be linked together. Over time you add more, and the command-line gets a little longer. Add a few more and it gets longer still. Before you know it you have a monster command-line and your build starts failing. Simple in theory, but tedious to do by hand. And doing it manually is like putting a ticking time-bomb into your makefile — it’s only a matter of time before your build grows enough that you have to go through this exercise again. I recently ran across a clever solution that exploits the $(eval) function in GNU make to split long command-lines automatically, eliminating the tedium and the time-bomb. After I show you the solution, I’ll explain it piece-by-piece. The max_args function takes three parameters: the base command-line, the number of arguments per “chunk”, and the complete list of arguments. It expands to a series of command-lines — one for each chunk of arguments. The trick behind max_args is the use of $(eval) to update a variable as a side-effect of gmake’s regular variable expansion activity. If you’re not familiar with gmake variable expansion, here’s a quick rundown: when gmake finds a variable or function reference, like $(something), it replace the entire reference with an expanded value. In the case of a variable that’s just the value of the variable. Most variables in gmake are recursive which means that if the variable value itself contains embedded variable references, those will be expanded as well, recursively. In the case of a function, gmake evaluates the function, and replaces the reference with the computed value. The meat of max_args is on line 3. It starts with the $(foreach) function, which evaluates its third argument, the body of the loop, once for each word in its second argument — in this case, the list of objects passed in the call to max_args. In max_args, the loop body has two components. The first is a call to $(eval), which simply appends the current value of the loop variable to an accumulator called _args. The second component of the loop body uses $(if) and $(word) to check the length of _args. The $(word) function returns the nth word from a list, or an empty string if there are fewer than n words in the list. The $(if) function expands its second argument (the then clause) only if its first argument (the condition) expands to a non-empty string, so together these functions check if _args has the desired number of words, and if so the then clause of the $(if) is expanded. If the chunk size does not evenly divide the number of arguments, the stragglers are emitted in a final command-line on the last line of max_args. max_args is handy but it has one significant limitation: command-line length limits are based on the number of bytes in the command-line, not the number of words, in it. Unfortunately, gmake has no built-in way to count the number of characters in a string. gmake does provide the $(words) built-in, so that’s what max_args uses. That just means that to use it effectively you have to take a guess at the number of arguments that will fit in a single command-line, for example by dividing the length limit by the average number of characters in each argument, then subtracting some to allow some buffer for outliers.